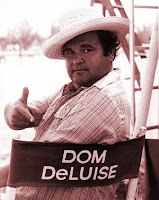 Dom Deluise, a comedy great, died last night at his Los Angeles home at the age of 75. Deluise led a life of hilarity in which he had a couple of his own television shows, wrote children's stories, compiled Italian cookbooks and even did a turn on stage at the Metropolitan Opera in the light-hearted Die Fledermaus where he played the speaking role of the jailer Frosch some 29 times. His most memorable performances were often in the films of writer-director-actor Mel Brooks who cast him in "The Twelve Chairs," "Blazing Saddles," "Silent Movie," "History of the World Part I," "Spaceballs," and "Robin Hood: Men in Tights." Deluise is survived by his wife of 43 years, Carol Arthur, and sons Michael, Peter and David. Copyright: Newman Enterprises LLC. Awesome Inc. theme. Powered by Blogger.